Last month I mentioned Color of the Cross a new Jesus film, due out at the end of this year, which is portraying Jesus as black. Anyone interested in that might be keen to see know that the official (?) website is now up. Color of the Cross, an independent, biblically charged religious biopic, based on the last 48 hours of Christ’s life, stands to be the most controversial depiction of Jesus to date. The film is unique in two distinct ways: The first dramatic film in Hollywood history ever to depict Christ as a black man. Secondly, it is the first Christian based film to inject race as a possible factor in the Crucifixion of Christ. This racial perspective to the conventional biblical story is sure to challenge Conservative Christian beliefs. The film places racial issues front and center in this growing religious discourse that is sure to become an additional topic for debate. According to Producer, Kenneth Halsband, "When you see the black man on the cross, you are immediately reminiscent of the 1960’s… Our film hopes to heal those wounds". The film, independently financed is currently in production and scheduled for theatrical release in fall 2006. 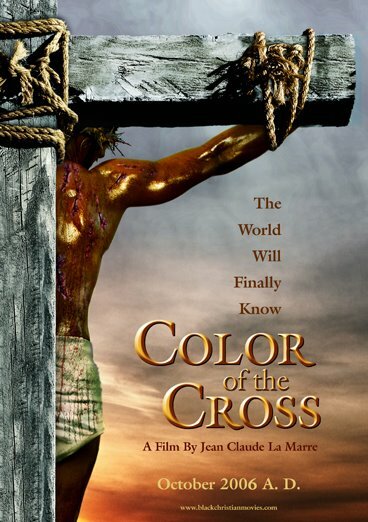 Color of the Cross, written and directed by lead actor Jean Claude LaMarre, and starring Debbi Morgan (Coach Carter, Woman Thou Art Loosed) as Mary, the mother of Jesus. It sounds a little bit like the publicity team for this film have learnt from how Gibson's film stoked the controversy and raked in the profit. I certainly hope this film is as popular and discussed as Gibson's, but I fear that it will be largely ignored. Although one pro-white group has already denounced the film, I don't imagine there will be many others. Hopefully most people will watch it with an open mind and come away challenged as a result. The trailer certainly whets my appetite for this film. It looks like the film-makers will emphasise Jesus's Jewishness strongly, and apply it to the situation facing the black community partly by the use of black actors in the central roles, but also by drawing on the common ground between the Jewish/Black people of colour being oppressed by white Europeans. This stands out in two places particularly. Firstly, the trailer's opening scene shows the boy Jesus asking his father "What's so special about tonight?" - the words from the Passover Seder. Later on we hear a voice say "die you black Jew". Whilst most Jews today, in Europe, America or Israel, wouldn't call themselves "black", the Jews of Jesus's day would, in general, have noticeably darker skin than their European conquerors. The film-makers are trying to draw this parallel out and, to an extent, fuse the two identities. That said another line from the trailer has Mary asking Joseph, "Do you think they are doing this because he's black?" Joseph replies, "They're doing this because he's the Messiah". It will be interesting to see whether that is the film's overall position, or simply it's primary question. 1. That the Bible describes Jesus' hair as "wooly" in texture and feet brown as brass. This is true but the passage (Rev 1) is strongly bathed in imagery and metaphor. Whilst this is a rare description of Jesus's appearance it appears to be more concerned with demonstrating who Jesus is rather than what he looks like. 2. Prior to the Roman Catholic church's commisioning Davinci, Jesus was always portrayed as a dark-skinned Semite. I'm not an art historian, and would certainly agree that post-enlightenment images of a white Jesus proliferated. That said I find it hard to believe that no-one ever portrayed Jesus as white before then. Is there not pre-Da Vinci stained glass windows or Celtic art that do this? 3. That Jesus' hair, as with most Jews of that period, would have been worn short. 4. After a price was placed on his head when he was an infant, Jesus was forced into exile, escaping into Egypt and hiding there for several years before returning to Jeruselem. Not to have been detected in Egypt assumes he was of the same color hue as the Egyptians. Not sure what to make of this. Certainly, I agree that he would probably be the "same color hue as the Egyptians", but there are many reasons why he escaped detection including the limits of Herod's jurisdiction and the obscurity of a peasant child. 5. Jesus was a descendent of Basheeba, an African woman. They shared the same lineage. I've never heard the claim that Basheeba was African, so can't comment on that directly, but his ancestory was overwhelmingly Jewish, and so whilst it's not impossible that he had a standard African appearance it seems extremely likely that his appearance was typically Middle Eastern. 6. Hollywood has never made a black jesus movie, before "Color Of The Cross" was independently made. This final point, I think sums up why I find this section so frustrating. The film has many undoubted merits, and will bring a whole new perspective to the way people look at Jesus, and possibly the racial issues of today. It doesn't need to claim credibility for its artistic perspective by assembling a few tenuous "facts" to imply the historical Jesus actually was black. Jesus was a person of colour, and that can be admirably highlighted by a film that portrays him using a black actor. But using such "facts" risks leaves an easy attack route for those who object to the film's worthiness, or even it's existence. Color of the cross tells a story that is familiar to most. However, since Jesus is portrayed as a black man. This version os the story of Jesus can examine the role that race may have played in the persecution capture, and crucifixion of Jesus. The movie addresses four areas: Jesus and his disciples, the state of mind of the romans occupying Judea, the issues facing the rabbis in the Sanhedrin and the family life of Joseph, Mary and their remaining children. The movie opens as Jesus and the disciples are approaching Jerusalem fir the last supper, and follows the events up to Jesus’ capture and crucifixion. In his post on the film Peter T Chattaway wondered whether "this film will be set in the past or present". He guessed it would be set in the past, and it looks like he was right. It's also interesting that whilst this film includes the last supper, and more extended flashbacks from his childhood, essentially it covers most of the same ground episodically as The Passion of the Christ. That said the themes it explores couldn't be more different, assuming that is that the finished film successfully realises its intentions. It wants to examine the motivations, minds and perspective of each of the major players in the story, Jesus, his family, the disciples, the Jewish Leaders and the Romans. So for many different reasons I'm looking forward to this film immensely. In particular, I'm looking forward to its fresh perspective of the racial angle implicit in Jesus's death, as well as its challenge to me as to his colour, and its implications. I also hope that this film will bring black Christians closer to Jesus such that they will be able to identify with him to a greater degree. There's something about the incarnation that means we tend to picture Jesus as being of our own race, and I think there's a role for that. I hope the film does for the black community and black Christians what Jesus of Nazareth (1977) did for the white Christians. only in the sixth century." The website and trailer is not on anymore. When I typed it in, there IS NOT ANYTHING OF THE FILM OF THAT SITE!! JUST ADVERTISEMENTS!!! Was the REAL MOVIE SITE DELETED??!! THERE ARE JUST SHOPPING JOBS ON THERE!!! 'CAUSE I DON'T SEE ANYTHING OF THE MOVIE ON THERE!! JUST TYPE IN WWW.COLOROFTHECROSS.COM AND YOU'LL SEE WHY!! 'CAUSE THERE IS NOT ONE THING OF THE MOVIE ON THERE!! !JUST SHOPPING STUFF!! 'CAUSE SOMETHIN' WENT WRONG WITH THE LINK!!! Yes I suspect that three years after the film was released paying for a website is no longer a priority for the filmmakers. Unfortunately I don't have time to constantly check and update all the links in over 800 posts. Thanks for drawing it to my attention. Does Anyone know Anything About This Jesus Film?